Provide comfort for the family of Eleanor Steiner with a meaningful gesture of sympathy. Eleanor Frances Herckner Steiner, 74 of Brielle passed away peacefully with her loving family by her side. Eleanor was born and raised in Newark, NJ to John Poulson Herckner and Alma Clementine Scholz Herckner. She summered in Manasquan as a youth and permanently moved to Manasquan in 1974. Eleanor graduated from West Side High School in 1962 and attended Upsala College, East Orange, NJ and Newark Computer School. 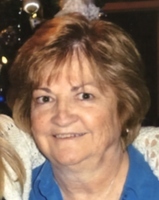 She was an active member of Holy Trinity Lutheran Church, Manasquan where she was a committee member of the Social Ministry. Eleanor was Manasquan Elementary PTO President, Manasquan High School PTO President, a member of The Big Blue Boosters Club, a class mother, Boy Scout Leader, and Brownie Leader. She worked in sales for DCI and Catalina Marketing, Manasquan after she raised her children. Eleanor was truly devoted to her children and grandchildren who were the love of her life. Eleanor was predeceased by her parents and her daughter, Dawn Michelle Steiner. She is survived by her loving son and daughter-in-law George and Denise Steiner of Manasquan; her loving daughter and son-in-law Denise and Pat Donohue of Wall; her cherished grandchildren Dakota, Paige and Patrick Donohue, Avery Brewer of Charleston, SC, Courtney and Ryan Steiner. Eleanor is also survived by her siblings Harriet Tice, Kathryn Fletcher, Marion (Skip)Weirman and Steve (Lisa) Herckner and many loving nieces and nephews. Family and friends are invited to attend a memorial visitation on Sunday, February 3, 2019 from 1-4 pm at Holy Trinity Lutheran Church 6 Osborn Avenue Manasquan, NJ. A Funeral Service will be held at 11am on Monday, February 4, 2019 at the church. In lieu of flowers memorial donations may be made to the Holy Trinity Lutheran Church Memorial Fund c/o Eleanor Steiner 6 Osborn Avenue, Manasquan, NJ 08736. To send condolences to the family please visit www.orenderfamilyhome.com. Eleanor’s life was centered around friendships that started as early as kindergarten and have continued through her life. She has never met a stranger and has always put others before herself. Eleanor truly lived life to the fullest. Donations are being accepted for: Holy Trinity Evangelical Lutheran Church. Provide comfort for the family of Eleanor F. Steiner (Herckner) by sending flowers. Sending out thoughts and prayers during this difficult time to Eleanor's family. I knew Eleanor from Meridian Gym. She was a wonderful lady, so full of life and laughter. I will miss her terribly. In honor of Eleanor Steiner who journeyed through life with grace, humor, resilience, and much love. There will be a void at the gym withou you. Rest In Peace, Eleanor. Eleanor was a great friend to everyone. Above all she loved her children. I’m sorry to lose her but happy l knew her.